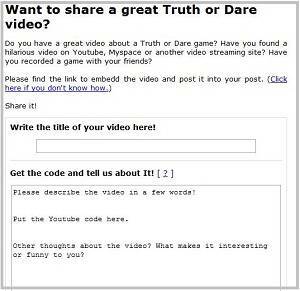 Do you Want to Help Out on this Truth or Dare Website? I really like your website and I would love to be a part of it. How can I help out? It's awesome that you want to help me out running this website. It's pretty successful already, but it always has room to grow. But some of them don't interact much yet. and by telling it to your friends. A quick way to add content to our site which will help it grow and get cooler and cooler is to do the following. You really like YouTube videos and just love to see people playing truth or dare over video...? Just head over there and search for good Truth or Dare videos. What you can then do is submit them to our website. We have explained how to put videos on our page in this help page. Have a look,study it and use the help to put the videos on our site. Please don't just share the videos - let us know a little bit about it by writing some text to it. The post will look better if there is some text written on it. Only a video link will be looking a little bit short. So here is what you can do. 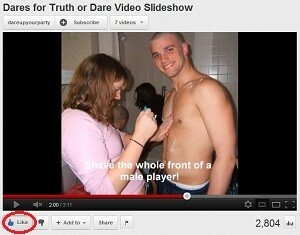 Look over to YouTube and check out one of the coolest truth or dare video you find. It doesn't need to be the most popular one or the video with the most "Views." On the contrary - check out the one video which might have only a hundred views, but it's really funny. It's always cooler to watch real people playing truth or dare. Then, get the embedding link from YouTube and write us a title of the video in just one line that what's the video is about. how the video is cool? and how it's not cool? and what Dare ideas you have that they could do? And the whole post will be a new page. Girls Doing Dares on Demand! That is one great way for you to help us out. Whenever you have the time to do this, I would find it awesome if you tried that out! Like Us on YouTube and subscribe to our channel! 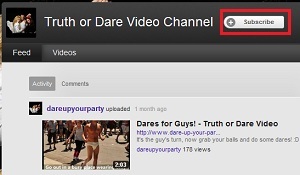 Another great way you can support us is just by clicking over to our YouTube Truth or dare Video Channel. Go over there and subscribe to us. What you can also do is just leave us a comment and let us know what you like. What videos you liked? What was great about the videos? And which videos you would like us to do in future. We will try our best to come up with great new Dare ideas and videos and add them to our channel. If you like a video, just give it a thumbs up and also leave a comment below the video so the other people will see what the video is all about. What you liked about it and what not. If you did not like it, just leave us comment too and suggest us how to improve it, we will make the next video better. It's a promise. If you have your own blog, myspace page or a tumblr blog, you can also share our videos directly by using the embedding code. Read here how to get the embedding code from YouTube. 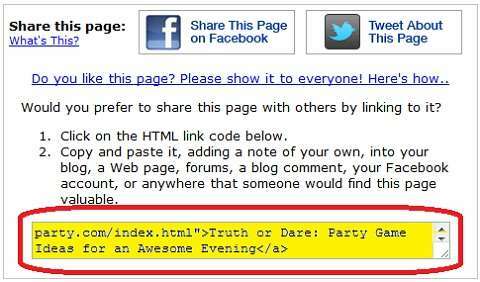 It's the same as you use the embedded code from the video of the channel of dareupyourparty and add it to your favorites or share it by using the facebook function, twitter or embedding the code into your blog. This way our videos will get more views, it will get more popular and will get more chances to be watched by more people in YouTube. If you spent a lot of time on YouTube already just take five minutes and support us on YouTube. We will be sure to add more great videos as a thank you. Send the link to this website around. Another great way, you can help us make this website known to everyone is to just use our "pay it forward" function to send our website around. To do this just scroll down to the bottom of the page where you will find "share this page on Facebook", or "Tweet about this Page." Just click on the symbol and follow the instructions. If you have a blog or myspace page or a forum signature, you can use a link to our page, using the embedded code in the bottom here. This is the easiest way to send our pages around if you don't want to email them to specific friends. This can help us to grow our traffic and get new people and friends to play "Truth or Dare" here on our website. How else cay you share our page? If you find any page which is interesting, for example our list of dares, scroll down and leave us a comment. To do this for any page you like just go there, scroll down and see if you can find Facebook comments at the bottom of the page. Leave us a comment right there. This will give us a feedback and your friends will have a cool link to click on Facebook and then they can read directly. For Example, the cool list of dares you find here. If there is anything else you really like, perhaps a game or some activity you want to do. For example, for the next pool party, you want to play a game of Pool volleyball, just copy the link from the browser and paste it on the Facebook. Facebook will automatically post the link along with the image so your friends will know that what's up on the next party. Those are just some ways to getting our pages known and you can help us a lot if you do that for us. I have a problem! I commented but my comment did not show up right away? Since I setup my website and our blog pages, I have gotten this question more than once from friends and visitors. After you comment on my website, your comment does not seem to show up right away. This is not a technical problem. On some of my blog pages, comments are set to moderation. This means that I will have to review your comments before it goes live. Your comment is not lost and you do not need to send it twice or three times. On other blogs entries, the comments you are submitting will show up automatically. However, it takes some time. Just wait for some time, perhaps half an hour and refresh the page, your comment should show up. 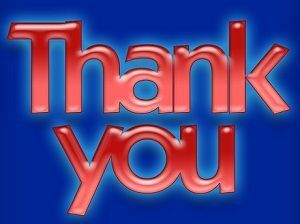 I will try to change most of my blog entries to automatic posting, so that you can see your comments as far as possible. In no case your comment will be lost or deleted. The only case where I will even consider deleting a comment is when it’s downright spam. This has not happened yet which means that you Rock. But I just want to make sure that there is nothing inappropriate on this website. Keep commenting away! I love getting your comments. Don’t worry about getting them lost, they will show up soon or later. That’s a promise. Want to try this out? Feel free to leave a comment below!